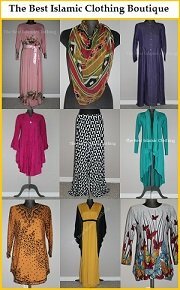 Underscarf made easy is providing you step by step instructions on how to sew your own hijab underscarf, with simple diagrams to follow. For some of us we are happy to make our own underscarf. Not only it provides us the freedom to design and style our underscarf, but also it’s very easy to make and at the end of the day gives you the self-satisfaction of having succeed in making your own product to your desire. Here underscarf made easy shows you simple instructions, tips and ideas on how to make your homemade underscarf from 2 basic patterns for hijab underscarf. Feel free to improvise them as you like. Purchase 0.7m (1yrd) of material – this will make two underscarves. 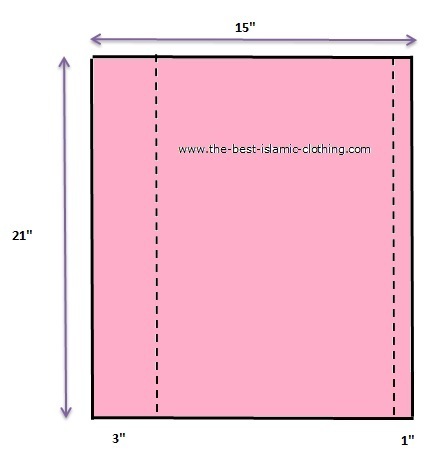 Stretchy material such as jersey or lycra is suitable for this style of hijab underscarf. Cut the material to rectangular shape 20” length x 21” width. Sew the front end 3 ½” from the raw edge and the back end 1 ½” from the raw edge. Allow ½” fold inside when you sew the raw edges. Fold the fabric lengthwise, wrong sides together. 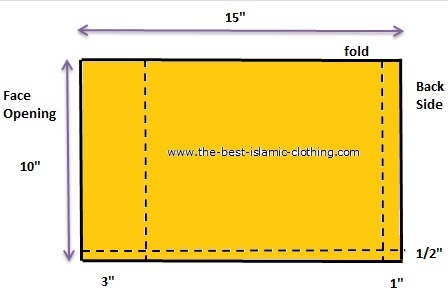 Once folded the material should be approximately 15” length x 10 ½” width. Sew the raw edges together ½” from the edges. At this stage you might want to try it on to your head before sewing, by raw stitching it together to get the desired fitting. This underscarf is worn like a headband. You pull the tube down around your neck, then pull it back and place it around your head. This way all your hair will be swept back off your face. The above measurement is based on average head size. If you have smaller/bigger face/head you could adjust it accordingly by adjusting the width of the material. If you want the tube hijab underscarf to be longer in order to give better coverage of your hair at the back when you’re wearing slightly thin hijab, you could lengthen the length of the material. Some of us prefer shorter underscarf especially if you’re living in tropical countries. You could adjust the length of the material to make it shorter tube underscarf. As you have already achieved in making this basic underscarf, you might want to go a little step further on making bonnet underscarf. Please visit our bonnet underscarf pattern for step by step of making your own bonnet style underscarf.